Okisollo is a hidden gem on the north east side of Quadra Island in the Pacific Northwest. 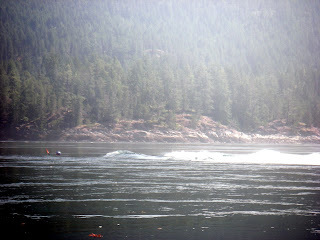 This little known Canadian jewel is becoming a favourite of adventure kayakers in British Columbia and area. What attracts these adventurers is the very feature that during the earlier ages of recreational kayaking would strike fear into the pioneering kayak crowd. A perfectly submerged shelf creates a beautifully formed standing wave on every flood. With max currents hitting over nine knots the resulting wave and chaos south of the leading wave where depicted as places to carefully avoid. Early kayak tourers would read of Okisollo in a multitude of guide books that all explained how to get through the area at slack tide thus avoiding the terrible fate that would overtake the unwary. Times change. Performance kayaks are becoming as popular as the station wagon kayaks that allow us to take just about every camping device invented into the wilds. Today kayakers seek out the danger and rush of surfing the surge wave. Some challenge themselves in unofficial competitions to see who can ride the wave the longest. Others take on the challenge of the chaos behind the wave. Testing themselves against the pyramid waves, the current, and whirlpools to see who can stay upright the longest and more importantly who can roll back or skull back up after the inevitable dumping. This phenomenon reflects the maturation of sea kayaking. We've moved forward from simple touring and benign recreation to the point where performance kayaks and more adrenaline seeking owners are becoming more common. But time keeps on changing. Now there is an application to explore the potential of Okisollo for electrical generation. Orca Power has applied for a permit to study the area to determine if it would be feasible to place a tide generator below the shelf that creates the ten knot floods at Okisollo. The government of British Columbia is embracing small hydro electrical generation proposals as a greener alternative to massive dam or hydro carbon power generation options. Not surprisingly this initiative has attracted potential power companies and investors to areas such as Okisollo, Skoocumchuck. This attention has raised concerns in the adventure kayak community. The initial Not In My Back Yard (NIMBY) reaction has already lead to a letter writing campaign targeting the provincial officials who grant the license applications and local provincial legislature members. Alarmist are painting a picture of industrial complexes complete with roads, power transformers, transmission lines and towers as the inevitable outcome if the research application should be granted. While the kayak community is indebted to the people who brought this to the attention of the kayak world this is not the time to mount a NIMBY campaign. Knowledge should always come before action. Further to the south an underwater tide current generator has been successfully installed at Race Rocks in Juan de Fuca Strait. Presently it collects power that is transmitted through underwater cables to the light house located on the islets. This power is then stored and used to reduce the dependence upon diesel generators on the island. This 'industrial' development has had no recreational affect on the area. Race rocks is still a popular destination for strong competent paddlers. Of greater concern here is the voluntary prohibition against landing on Race Rocks. The light house keeper is a bear with a minimal grasp of diplomacy. Instead of meeting kayakers at the shore and asking them not to land in the interest of protecting the colonies of seals and sea lions. He's been known to aggressively confront kayakers. Including one occasion when the islands where completely shrouded in fog. “Can't you people read? You can't land here,” he shouted, pointing back into a fog so thick you could not see the mans hand at the end of his arm. But as far as power generation goes the Race Rock experiment seems to be working fine. One advantage of this location is that it works on both the flood and the ebb. At Okisollo this may not be the case which would seem to reduce the efficiency of area. Nevertheless a below surface generator located deep enough below the shelf might not have any adverse affect for kayaking in the area at all. If warranted power from such a generator could be transmitted through underwater cables to the nearest road head miles south below Surge Narrows, then through lines located adjacent to the existing road. It might be that the generator may not be located below the shelf but further out in the channel. Without research date who knows. Indeed it could be that, if feasible and I stress “IF”, such a power development might have a beneficial effect. As Okisollo becomes more popular facilities should be developed to protect the area. Apparently 1,500 people accessed the area this past season. That's a lot of people in an area that has no facilities at all. No designated camping, no toilets – nothing. While many kayakers and recreational users know how to minimize their impact on the environment there are many others who do not and care nothing about what they leave behind or how they leave the area. Road improvements could also bring more kayakers to the area. That might be good or bad. In any case this initiative bares careful watching. It will be interesting to see what the research turns up if the application is granted. What is certain is the inevitable quest for electrical power, the increasing demand for more environmental power sources and the desire to protect existing recreational areas will bring us into conflict. Mitigating the impact and striking a balance between conflicting needs should be our goal. As for Okisollo it maybe that it's not suitable for electrical generation at all. Time, research and knowledge will tell.